Cranberries, those super tart berries we usually only enjoy during the Holiday season, provide some healthy benefits we should take note of year round. These little red fruits are chocked full of plant phytochemicals. Some of the potent plant chemicals found in cranberries include anthocyanidins, ellagitannins, quercetin, and catechins. Many of these phytochemicals have been documented to have anti-inflammatory, antioxidant, and even anti-cancer properties. They also contain vitamin c, beta-carotene, glutathione, and vitamin E. There’s no doubt they make a heart healthy addition to the diet, but they also provide some more unique benefits. UTI (urinary tract infection) prevention may be the most well known health benefit associated with cranberries. UTIs are an infection of the urinary tract, with bacteria as the most common cause of infection. These can be painful and could lead to an infection of the kidneys if not treated adequately with antibiotics. Unfortunately some people are more prone to UTIs than others. For these individuals preventing UTIs is more ideal than continually taking multiple courses of antibiotics which could lead to antibiotic resistance. Proanthocyanidins, one of the cranberry’s beneficial plant chemicals, has been shown to have the ability to wrap itself around E. coli bacteria-a common cause of UTI infections, and prevent it from sticking to the walls of the urinary tract. There have been numerous studies conducted on this subject. In an analysis of 10 different studies involving juice and capsules, researchers found that women with frequent UTIs were able to significantly reduce the incidence of infections by 35% over the course of a year. (Cochrane Database Syst Rev. 2008 Jan 23;(1):CD001321) The Society of Obstetricians and Gynecologists of Canada recommend the use of cranberry products as an option in preventing recurrent UTIs. 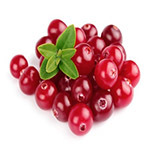 Cranberry’s ability to prevent infection is being studied in other areas of the body as well. Studies have found that cranberry can also reduce H. pylori’s ability to stick to the lining of the stomach. H. pylori is the bacteria that causes stomach ulcers. A double blind, randomized study conducted in 2005 and published in Helicobacter, researched the effect that cranberry juice had on H. pylori infection. The people they studied were in a part of China where there is widespread H. pylori infection resulting in high rates of gastric cancer. The study found that about 2 cups of cranberry juice a day was able to significantly suppress infection of H. pylori. Guzzling multiple glasses of sugar-sweetened cranberry juice every day may not be the best option if you are counting calories, even though it has been shown to be effective for UTI prevention. Unsweetened, natural juices would be a much better option. You can add a touch of stevia or agave nectar, etc. to lightly sweeten if needed. Roughly one to two cups per day of juice have been used in studies for UTI prevention, with some studies using even less than a cup per day. Cranberry extract capsules are also available for those who don’t like the taste or who cannot drink the juice. Frozen whole cranberries can be made into smoothies and dried cranberries can add zip to a variety of dishes.